In recent years, several industry observers have commented that the industry has too much product manufacturing seeking too little distribution. Clearly, finding additional distribution outlets, and more importantly, the most appropriate distribution channels for one's company are major priorities today. This is especially true as companies look to better penetrate the vast under-served middle income market. In our recently published ACTEX book, The Art and Science of Life Insurance Distribution, we provide what is arguably the most thorough exploration of this topic to date. As recognition of this, the text has been selected for inclusion in the Society of Actuaries' life exam study notes. However, the relevancy of this text goes far beyond just that of the actuarial department in a life insurance company. 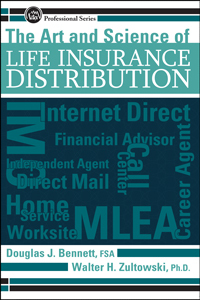 In addition to tracing the history and evolution of the various distribution channels utilized in the life insurance business today, the text also addresses such topics as the functions provided by distribution, the management of distribution, distribution compensation, the economics of life insurance distribution, and presents a model for compensation design. Perhaps most importantly, we introduce the concept of aligning distribution channels with selected target markets and products, in an attempt to answer the frequently asked question; "Which distribution channel is best for my company?" 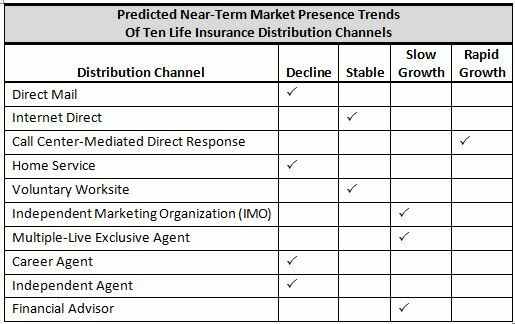 Of all the topics covered in the text, however, the one that has proved to be of greatest interest, however, is that in which we speculate of the future success of the ten primary channels used in the distribution of individual life insurance today. The following chart shows these ten primary distribution channels, along with our projections of their success in the near future. Pure direct mail, without any human interaction at all, is predicted to decline due to the consuming public's saturation with direct mail solicitations and the increasing role of technology in direct response marketing. Perhaps surprisingly, we also do not envision the internet direct channel, again without any human intervention, as growing significantly. This is not to say that technology won't play a role when it comes to consumer behavior in the purchase of life insurance, especially when it comes to the buying behavior of younger consumers. It will. However, market research continues to show that consumers want some human interaction when it comes to the purchase of life insurance. They will shop for products on their own, but look for some validation by an "expert" that they have made an appropriate decision. Thus, the channel predicted to see the greatest growth is that of what we call "call center-mediated direct response." This channel eliminates the negative perceptions of traditional life insurance agents (e.g., overselling, pressure selling, interest only in commissions), but retains personal interaction with a professional sales advisor. Both the IMO and the multiple-line exclusive agent channels have, in their different market focuses and business models, figured out how to sell product to the vast under-insured middle market through agents. As a result, both are seen as experiencing steady growth as life insurance distribution channels in the near future. Finally, both the traditional career and independent agent distribution channels have seen declines in their numbers in recent decades largely due to the aging demographics of the field force and the difficulty in attracting younger people to a career selling life insurance. While not declining to the same extent as the home service channel, these channels are predicted to continue their decline as a presence in the marketplace. As many financial advisors expand their practices to include life insurance, as typically happens in a bear market, the financial advisor channel is also predicted to grow somewhat in popularity. Changes in estate planning laws, which for years provided a robust market for life insurance sales among financial advisors, however, will serve to temper this growth in the near term. 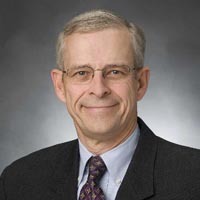 Walter H. Zultowski, Ph.D, is co-author of The Art and Science of Life Insurance Distribution, ACTEX, 2014. Walt is a respected market researcher and public speaker with more than 30 years of experience in life insurance and economic trends affecting Americans. He is Principal of WZ Research + Consulting, a boutique consulting and market research firm serving the life insurance and financial services industries.